(Above) Clear and frosty nr Kingussie this morning; blue skies even! Though a cloak of mist hung low in the glens when travelling further west to Creag Meagaidh. 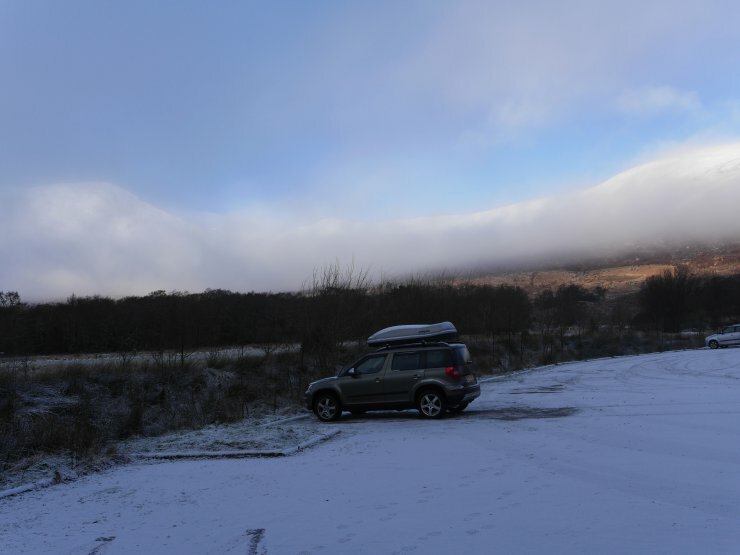 The car park this morning, with a tantalising glimpse of broad, sunlit uplands beyond. 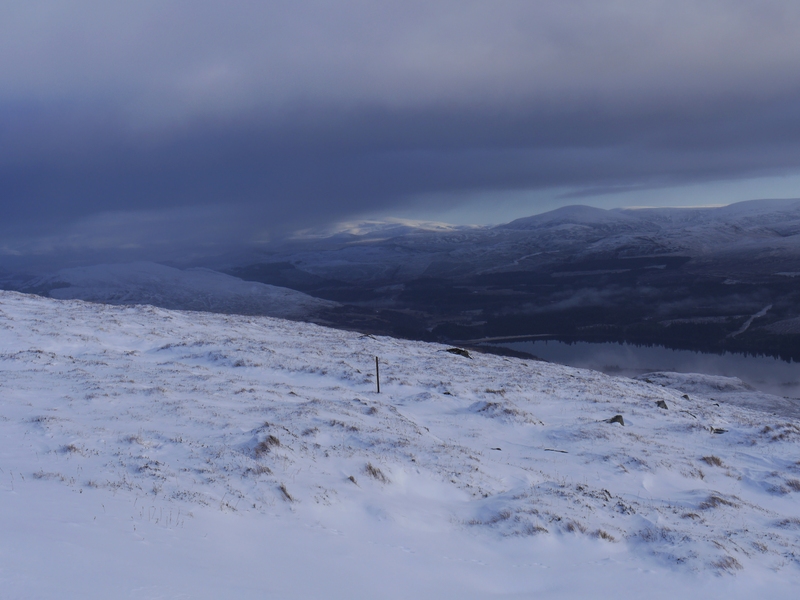 (Above) The east end of Loch Laggan with the rounded hills nr Gaick and Drumochter enjoying a relatively cloud-free day by the looks of it. Reasonable but generally thin cover of snow above 650m today. 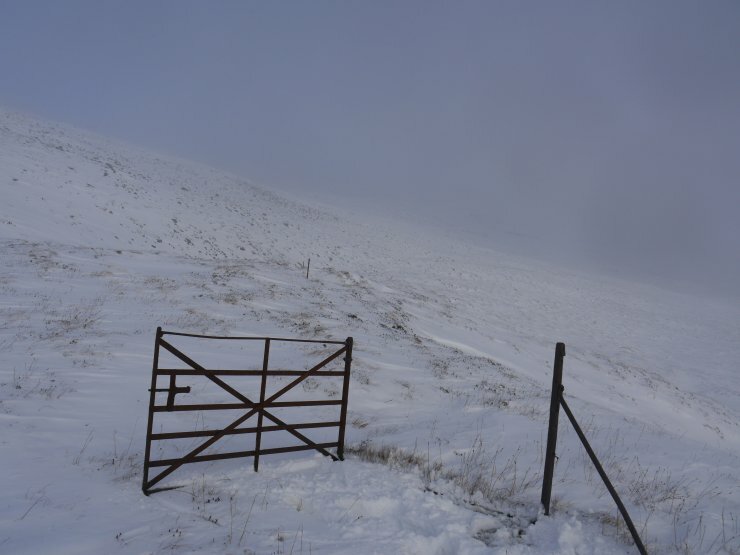 (Above) The gate at 800m on the ‘main drag’ up to Carn Liath. Haven’t featured this anachronistic gate in the blog for ages. A throwback to a time when there was a fence all the way up from Aberarder to the boundary of the estate on the Carn Liath plateau. (A few old iron fence posts still visible). Often wondered, ‘Why here?’ when passing it. Don’t think there was a shieling or similar in this spot back in the day. A curiousity, then. Anyway, as a courtesy to passing walkers I left the gate open to ensure unhindered access for one and all. 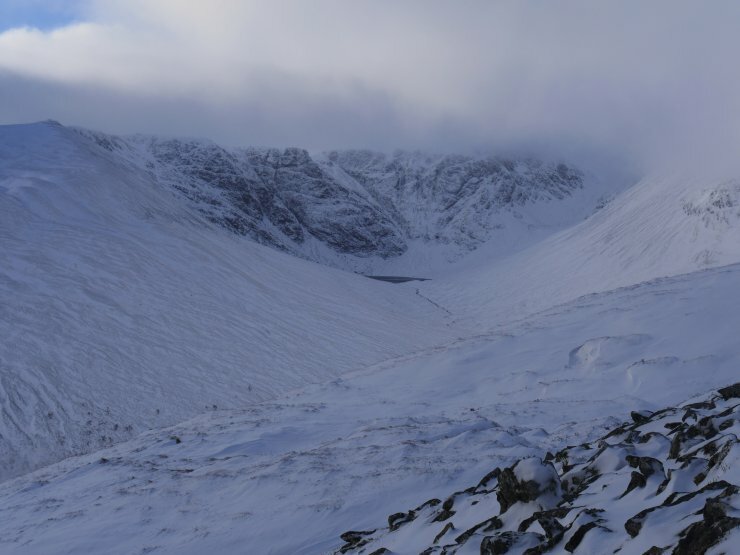 (Above) A look down into Coire Ardair with the Post Face et al at the upper end. Mist/cloud rolled in and out at different altitudes throughout the day. Now all the sheep will get out! Oops! T’was an impulsive and defiant thing to do, I know. I’m sure a more socially responsible and upright citizen passing that way will right my wrong!